Happy Friday, everyone! Today I am wearing what I think will be the perfect summer weekend look: a comfy dress, a jean jacket, and fun wedges! This jean jacket is from Old Navy and is very good quality. I have been on the hunt for a denim jacket for awhile but could not find one I loved that didn't break the bank! I scored it for under $25! I featured these wedges from Bearpaw last week with my scalloped shorts. They are so comfy! I have them in blue but they come in five colors... you can shop here! This dress is from a fun new to me boutique, Little Nook Boutique. It is a great shop and things are very reasonably priced! This dress is currently on sale for only $25. Little Nook Boutique so graciously offered to give a reader of A Memory of Us a gift card to their shop! If I could enter, I would definitely buy the pretty little thing maxi dress. Enter using the rafflecopter below -- complete all the entries for the best chance to win! Today is another almost all Express outfit (surprise, surprise). The top is new, but the white jeans are actually four years old! Finding good jeans is no easy feat and finding good white jeans is even harder! These are four years old and I still love them! I have the white jean leggings. They have held up through wear and washes! I like them because they have not lost their shape and have also not lost their "color". I highly recommend them! I also scooped us this top at the Memorial Day sale. Online it describes it as "cropped floral zip back top"... I do not know where they get the word "cropped" from... unless there is a a cropped version too, haha! There also is a skirt in the same pattern. I tried them on together and surprisingly liked how they looked! However, the skirt was a little "poofy" for me to purchase it. Hope you have a great day! Come back tomorrow for a fun giveaway! Also, speaking of giveaways... the winner of the Clique Boutique giveaway is Alex! Congrats Alex, Clique Boutique will be contacting you directly. When I came up with this outfit in my head, I was not intentionally channeling my favorite fictional character.... but that is what happened! I felt very Blair Waldorf in this outfit the second I put it together. Poor Tyler knows my obsession with Blair and Gossip Girl and actually said "You look like Blair in this outfit" when I walked downstairs. (Brownie points for him.. right?!) A collared shirt, pencil skirt, and pearls make the outfit. Although I'm sure Blair would have paired the outfit with some killer heels ;). Hi everyone! I hope you all had a great Memorial Day weekend! My weekend was jam-packed with a house warming party for two friends, shopping, laying out by the pool, seeing the movie "Neighbors", and going to a baseball game! Memorial Day is about so much more than just big sales and going to the pool. This was our second year going to the Royals game on Memorial Day. We enjoy going on Memorial Day because the Royals put on such a great celebration of the military before and during the game. It is so heart-warming to see those who deserve it get recognized. It is impossible to not feel patriotic and proud of our country when you see a giant flag covering the whole field and hear everyone singing the national anthem. It was a very great weekend! Today I am wearing one of my Memorial Day shopping finds: these high rise side zipper white shorts from Express! I desperately needed to replace my white shorts since the ones I have been wearing are from my junior year of high school! I actually still really like them, but the color has faded and they just do not look very nice anymore. These are perfect! They can be dressed up or dressed down and they are extremely comfortable. Unfortunately, I cannot find the white online but they do have them in other colors. What did you score during the sales this weekend? P.S. Today is the last day to enter the giveaway from Clique Boutique! Happy Friday!! Who is excited for this three day weekend! ?Currently we have no plans for the weekend and I could honestly not be more excited. This is our first weekend since March that we can literally do nothing! I am looking forward to it : ). Today I am wearing a new dress from Oasap. I seriously love their pieces and their prices cannot be beat! I most recently styled one of their dresses here. I loved this dress as soon as I saw it online. I loved the lace and the color. I also really liked that it was not super fitted. If you scroll through the pictures on the website you will see that it is a little baggy if you do not belt it. I think it looks cute either way! Today I belted it, but next time I will style it without one. Don't like the green? It comes in five colors! (I also love the red one and the white one.) It is less than $20 and if it is your first time ordering from them you can use coupon OASAP1ST for 16% off! I also did not realize until I was looking at the pictures that I was wearing watermelon colors. A green dress with pink accessories? Clearly my mind is on summer! Also, please forgive the crazy wind in these pictures. Hope you have a great weekend! Don't forget to enter the giveaway for a Clique Boutique phone or mac case! Hi everyone! Today is another wedding post (to see all my wedding posts, click here). We have been making a lot of decisions lately -- but nothing really worth writing about. Since we last "spoke" we have reserved our rehearsal dinner space and I have been trying on wedding dresses! One thing we just accomplished was reserving a block of rooms for our out of town guests. I was not originally going to write about this, but it was such a pain in the @$$ that I decided to share my experience! First, before you start calling hotels just be prepared to never actually get to talk to anybody. You will call a hotel and get put through to the front desk, who will transfer you to somebody, where you will leave a message and most likely never hear from them again unless you call back. Not kidding - this was my experience with five different hotels! Second, you need to figure out what is important to you. The most important thing to us was to have a shuttle bus that would take our guests to and from the reception site. We did not want our guests to have to worry about a way to get home! We only considered hotels with a complimentary shuttle. Here is a list of everything I made sure to ask about! 2. What amenities will be included for guests? 3. Is there a penalty for not booking enough of the reserved rooms? - Some places require that 80-85% of the rooms you reserve must be paid for. This means that if you reserve 10 rooms and only 5 of them get reserved by guests you will be paying the cost of the remaining 3 rooms to make it so that 80% of the rooms are reserved. Others just say if 2 weeks out, the rooms are not reserved they become available to the public. 4. Can we add more rooms closer to the wedding date? - We have a good guess of who all will need a room but we are not so sure how many people will share a room. We wanted to make sure that if we only reserved 10 rooms but we had 12 people call for a room, those extra 2 people would be given the same rate. 5. Anything for us if we book a certain number of rooms? - Most hotels did not give anything here, but one told us that if we book the honeymoon suite $5 from each room reserved will go towards our bill. So 10 rooms booked = $50 off of our room rate for the night. Not huge, but every little bit helps! 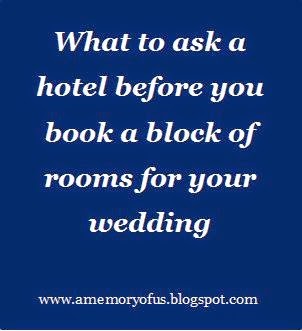 - Again, most hotels do not give you anything here unless you are paying for the rooms or also having your wedding there. Still, it does not hurt to ask! These are the main things I focused on when I spoke with the hotel representatives. I felt like I covered all the main topics and am very excited about our decision! I think we got a great rate for a room for our guests and I love that they will be able to get to and from the reception safely. We also booked a hotel without a penalty for only reserving a portion of our blocked rooms -- which takes a lot of stress away! What things did I miss? Is there anything else you recommend asking? Let me know in the comments below! Also, don't forget you can use code MEMORYOFUS at Enza for 40% off until 11:59 PM Monday and DARCY20 at White Plum for 20% off until May 28. And before you go be sure to enter the giveaway for a new phone or mac case from Clique Boutique! I have been wanting to add an article of clothing with scalloped edges to my wardrobe for awhile, but could never find exactly what I was looking for. I absolutely love the scalloped shift dress from J.Crew Factory. However, so many people I know own it so I felt that if I really wanted to wear it I could just borrow it! I stumbled across these scalloped shorts from White Plum Boutique and pretty much added them to my cart within 30 seconds. I love the color and they are seriously so comfortable. They feel like I am wearing a pair of Nike athletic shorts but look way nicer! They come in three colors and I am very close to ordering another pair! (I am seriously obsessing over the mint!) I reached out to White Plum and they have offered a coupon code for my readers! You can use the following code for a discount, DARCY20, for 20% off until May 28th! Also, these wedges are from Bearpaw. I had heard of the brand before but always thought they just made boots. They are seriously so comfortable! These are less than $50 and come in five colors! If you order a pair, I recommend ordering a 1/2 size up. I normally wear a 6.5 but a 7 in these fits perfectly! And how adorable is this phone case from Clique Boutique? It is my favorite one I received and feel like it compliments this outfit perfectly! In case you missed it, they are currently hosting a giveaway for one reader of A Memory of Us to win a case of their choice. Enter below! Hi everyone! I hope you all had a good weekend. My best friend from high school, Carrie, and her boyfriend, Nick, came to stay with us for the weekend. We had a fun time showing them around Kansas City and going to the Royals game! Today I am wearing anew shirt from C.C. Lake. If you have not heard of them before, you need to go check out their shop immediately! They have the cutest stuff and it is all very well priced. Pretty much everything in the store is under $50. I have my eyes on the Garden Party dress and Golden Rose shorts right now. The Summer Festival top I have on now grabbed my attention right away. It is super soft and comfy and I know I will get tons of wear from it! If you order anything from C.C. Lake use code xoxo for 10% off! Happy Friday, everyone! Today I am sharing one of my favorite weekend looks. A maxi dress looks so put together but feels like you are wearing sweat pants. (What is better than that!?) When I'm going for an easy look I try to keep my accessories minimal. A hat and simple necklace were all it took to complete this outfit. I am really thinking I need to add another maxi dress to my wardrobe! I love this one and it is less than $25! The other best part of this outfit? It is all over two years old. The wedges are actually from my confirmation in ninth grade! I love that I can still wear them. PSA: Hunter Rain Boots are on sale for $90 at Zappos right now!! Check out the selection here! When I put this dress on, I just felt very feminine and playful! Something about the shape of it just seemed so fun. The colors and pattern were a little out of the ordinary of something I would choose, but I really love it. I think it is so cute and will be perfect for a night out with friends! You can shop all Mart of China dresses here and use coupon code "coupon15" for 15% off your purchase! Tonight, Tyler and I are going to see Needtobreathe in concert with his younger brother, Cameron, and Cameron's girlfriend, Jill! Needtobreathe has come to town twice since I started listening to their music but I could never make the show, so I am so excited to finally get to to see them. Hope you all have a good night! To go with the theme from yesterday, I am sporting a cute new short sleeved blouse from Zara! When we were in Chicago, I was able to go to Zara for the first time. I had been wanting to purchase some of their clothing for awhile, but was not sure about how their sizing worked. I definitely had to size up in some things, so I was glad I was able to try them on before ordering! I think this top will be so perfect for warmer weather. I hardly have anything in this color so I am really excited to style it in more ways! P.S. The wind was almost impossible in these pictures so please excuse the random hairs flying everywhere!